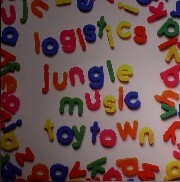 ...Jungle Music is the quintessential Ronseal tune - it does exactly what it says on the tin! Proving that Logistics is a true player of the scene, this is vintage Jump-up at its very best. Simple, deadly, route one stuff. On the other side of the disc it’s the twisted toy pianos and stuttering electro synths which bring us back into the future. Toytown has us checking the reality, and it’s warped funk like only Logistics knows how. As you would expect dubplate support on these is already massive, with Fabio, Bailey, Matrix, Friction and many many more.